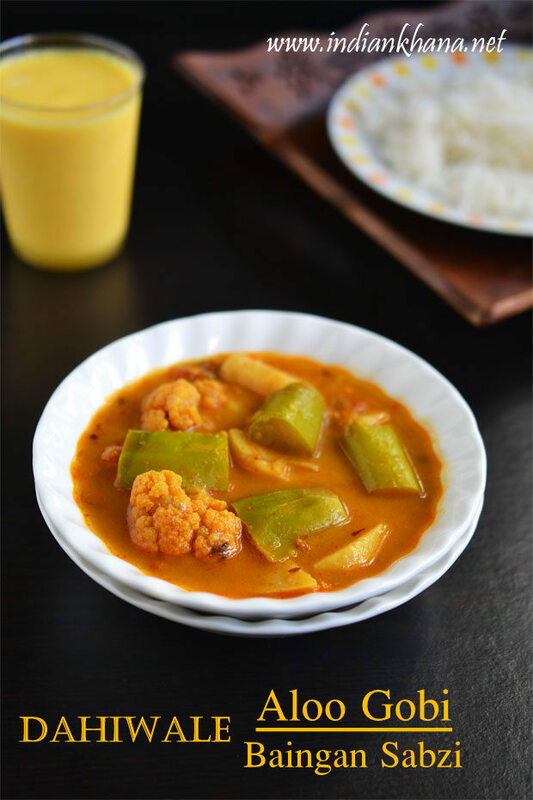 Potato Green Eggplant (brinjal) Cauliflower Curry or Khatta aloo, hara baingan gobi sabzi is sweet, sour and spicy curry made with medley of vegetables and yogurt. This is Chhattisgarhi specialty which I learnt from at my in-law's place, normally green eggplant or brinjal is cooked with yogurt as purple brinjal and green brinjal taste differs and to make it more delicious green eggplant is always cooked with something sour curd or butter milk. Using 2, 3 or 4 vegetables in a curry is very common in my in-law's place like in my parent's home we normally pair 2 to 3 vegetables and using 4 vegetables is rare but at in-law's place the more the merrier :) And you should try this medley of vegetables it's really yum and wholesome to have plenty of vegetables in a single curry. Now a days I am mostly cooking this way use 4 to 5 different vegetables to make curry whether it's side dish with roti to rice it's same for me now. 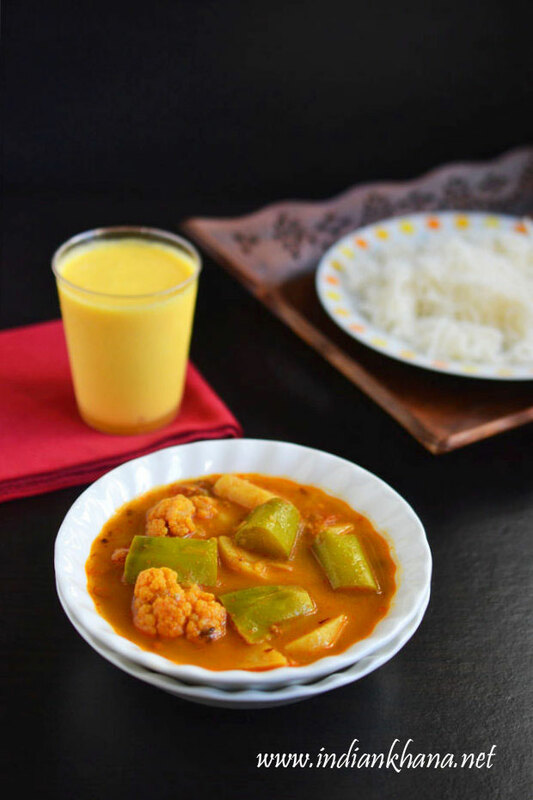 Specialty of this curry is it's goes perfectly with steamed rice so we don't have to make any dal just make this sabzi and rice and you have a fabulous lunch or dinner and this curry also goes well with roti or paratha though personally we prefer with rice. You can skip cauliflower in this curry if you wish or add any other vegetables like broad beans, peas, drumstick, pumpkin or wadi (badi) etc, I had no plans to post this curry so didn't clicked step wise pictures and as always changed the mind in last minute so no step by step pictures this time, shall try to update it some time. 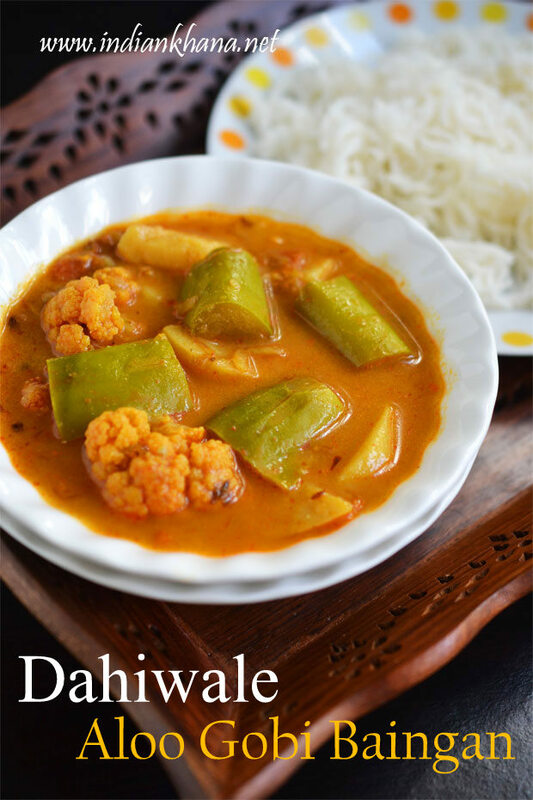 You can also check other Chhattisgarhi recipes here. Potato, green eggplant and cauliflower cooked in yogurt gravy with spices. Wash, peel and cut potato into bite size pieces (8 to 10 pieces of 1 potato), cut cauliflower in florets and cut eggplant in 1 inch pieces or bite size pieces (not very small as it will get mashed). Peel and slice onion, chop tomato, green chili, coriander leaves (cilantro). In a wok or pan heat oil add hing, cumin seeds and allow to splutter. Add onion, green chilies, ginger-garlic paste and saute until onion becomes golden brown. Add potato pieces and cook in medium flame with regular stirring for 4 to 5 mins. Add red chili powder, coriander powder, turmeric powder and mix well, now add cauliflower, stir and cook for 2 to 3 mins. Add tomato, eggplant (baingan) mix well, cover and cook until tomato gets mashed. Add 2 to 3 cups water and bring it to boil, simmer for 5 mins. Now add salt, amchur powder (if using), jaggery, beaten yogurt and mix well. Simmer for another 5 to 7 mins in slow flame, add coriander leaves mix and off flame. Serve with steamed rice, jeera rice, roti or paratha. Use little sour curd or butter milk (if using butter milk don't add water or reduce it). You can avoid cauliflower or replace it with any other vegetable. 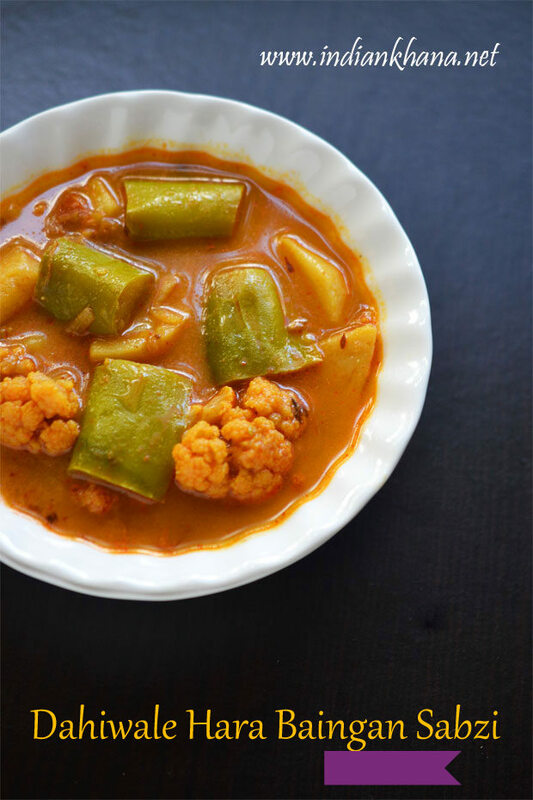 You can avoid jaggery but that's bring good sweet, sour and spicy flavors to the curry. If you are going to serve this with roti or paratha reduce water to 1 or 1.5 cups, this curry goes well with rice too, I served with both. 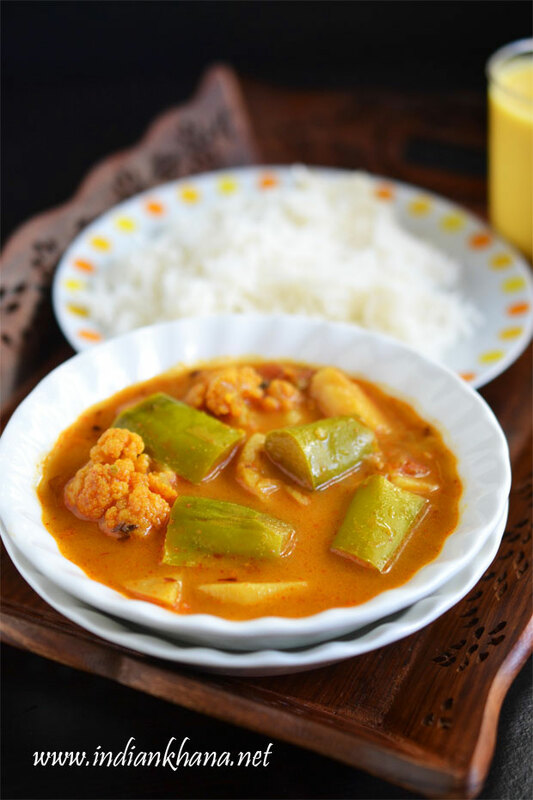 Sweet, sour and spicy curry, makes a good side with roti or rice.